Director: Christopher Guest. Cast: Eugene Levy, Catherine O'Hara, Christopher Guest, Jennifer Coolidge, Jane Lynch, Michael McKean, John Michael Higgins, Parker Posey, Michael Hitchcock, Fred Willard, Jim Piddock, Bob Balaban, Don Lake, Ed Begley, Jr. Screenplay: Christopher Guest and Eugene Levy. One of the principal characters of Christopher Guest's Best in Show, Eugene Levy's Gerry Fleck, literally has two left feet. I mean, both of his shoes curve in the same direction, making him an awkward walker. The visual gag doesn't become important to the film until Gerry has to walk his terrier, one of many contestants in the national Mayflower Dog Show, around the floor of a Philadelphia arena so the pup can be judged for the top prize. Luckily, though Levy's character trips a little bit, the film he co-wrote with actor-director Guest seldom stumbles in its amusing hour and a half. The worst that can be said about Best in Show is that it's never quite funny or pointed enough to justify its being made. Its talented cast of improvising actors generate more laughs than most of this year's comedies, but like the dog-show contestants they're playing, they are ultimately walking in circles. Comedies that endure tend to do so because they are either uniquely perceptive, uniquely well-constructed, or uniquely hilarious. 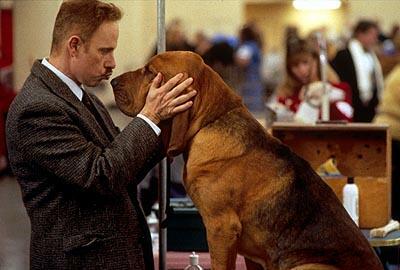 Best in Show, for all its yuks, is none of these thingsa very easy film to watch, but no prizewinner. In addition to Gerry and his wife Cookie (Catherine O'Hara), the other featured participants in the Mayflower pageant are Harlan Pepper (Guest), a fisherman from North Carolina with high hopes for his bloodhound; Sheri Ann Ward Cabot (Jennifer Coolidge), a silicon-enhanced trophy wife who employs the much-awarded Christy Cummings (Jane Lynch) as the personal handler for her poodle; Scott Donlan (John Michael Higgins) and Stefan Vanderhoof (Michael McKean), a gay couple who are as avid displayers of themselves as they are of their shih tzu; and Meg and Hamilton Swan (Parker Posey and Michael Hitchcock), a quarrelsome pair whose dog has been erratic and depressedand in therapysince catching them in bed. Like Guest's 1997 hit Waiting for Guffman and 1984's groundbreaking This Is Spinal Tap, which starred Guest and McKean, Best in Show is structured as a mock-documentary, abandoning any attempt at visual sophistication and interspersing "interviews" with the characters among the scenes of their journeys to the competition and their fierce rivalries once they've arrived. Surprisingly, the faux-documentary style of Best in Show doesn't always register strongly, for two reasons. First, there's no reason why interviews can't be incorporated into a fictional film, as everything from Reds to When Harry Met Sally... has proved, and because Best in Show neither features nor requires any notion of who is conducting the interviews and holding the camera, the formal strategy seems to exist only because it's what we expect from Guest. By contrast, Rob Reiner's ambivalent admirer in Spinal Tap was an integral part of that film's construction, since the title band only existed so that starry-eyed, wholly forgiving fans like Reiner could, however improbably, worship them. Best in Show lacks that kind of grounding vantage point. I suppose the film's cheap-video aesthetic may serve to remind any non-believers in the audience that these events really happen. Personally, I needed no such reminder, since my high-school math teacher owned 32 dogs at last count, and frequently missed class to take a hound to a Missouri tournament or a Maryland exhibition, or to recarpet her suffering floors. Besides, though the intimacy of video is undeniable, Dancer in the Dark is only one film in current circulation that clarifies that video footage does not necessarily equal a basis in reality. The second reason the mockumentary style seems expendable here is that surprisingly few of Best in Show's considerable arsenal of laughs are deeply embedded in the dog show anyway. One of the film's most humorous characters is Fred Willard's sports announcer, who is clearly out of place at this particular event, and who provides coarse jokes, inappropriate analogies, and ridiculous rhetoric that hilariously obscures the rules of the dog show rather than describing them. Part of what makes the role delicious is that the fatuous commentator is inseparable from the context of an arena showcase. By contrast, the other actors play outsized character types whose zany true colors are certainly exposed by the fierce competitionand yet, only half the movie takes place at the competition, and many of the laughs have nothing to do with the mute "stars" of the movie, the dogs. McKean, Higgins, and Coolidge, are a riot breathing life into their obvious stereotypes, and no one in the cast disappoints, but they often get stuck in implausible, unnecessary, even dull or distasteful scenes ostensibly required to pad a thinly conceived plot. Levy and O'Hara spend a draggy ten minutes at the home of old friends, a stop-off en route to Philadelphia. Posey improvises some good lines at a psychiatric session, but again, the scene could fit into any number of farces, with or without canines. If dog shows bore quite the same level of parodic opportunity as the heavy-metal milieu of Spinal Tap did, Guest and his cast might not have to force punchlines out of thin (read: loosely scripted) air. The seasoned O'Hara is reduced to a pratfall, and even the director's own on-screen dabbling in ventriloquism is an idling comic bust.